Good afternoon.......er, at least I think it is. The sky and air cannot decide to do clear and cold or.... grey and cold....or windy. It's been such a long time between posts....time to catch up. Spring in Minnesota is more of an April Fool's joke than anything else. We had snow this morning, glare ice on the driveway and all. Since it's not blizzards and tornadoes like some parts of Minnesota, I am going to still call it a win. Since it was 61 F. two days ago, it just feels miserable by comparison. But, as always, there are worse problems to have. Geese are coming back, the robins look betrayed, and the blackbirds are sounding off each morning. That makes early treks outside with the dog at least slightly more pleasant. The soundtrack to the coming warmth is a nice teaser all the same. 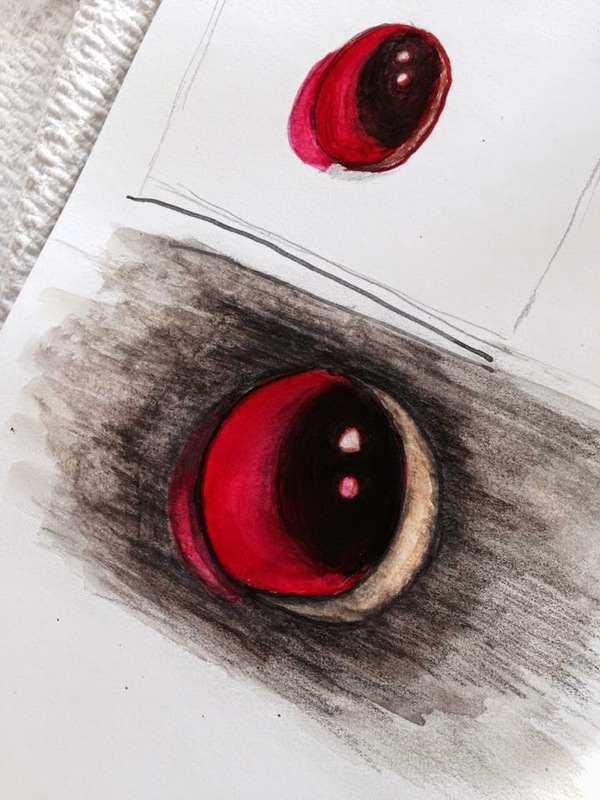 For clarification, the sketch at left is a study of light through a gemstone in a 'fantasy' setting. Not creepy owl eyes, the assertion from my six year old daughter notwithstanding! My current plan, relative to the project, is to shoot for six good hours of sketching or painting per week, in hopes that some weeks will be impressive.... to cover the weeks that are not. pointe shoe project? That took MONTHS longer than I had expected, the trouble being I know practically nothing about beading or sewing! Had I done a mock-up, and talked to the right people, I would have finished several weeks sooner. I am delighted with how they turned out, but let's say there was blood to go along with the sweat, and I'm in no hurry for a project like that again!! Happily, the current project requires work in areas I am quite comfortable with, though somewhat out of practice. Let's just say that by upping my sketching time, I am redeveloping callouses on my fingers - a good sign of effort, if not a commentary on outcome! I am happily in the fun part of the project, the concept art, so my focus will be on playing with techniques and styles for specific subject matter, to find out what will play together, stylewise, and what sounds cool but simply will not fit. With my current schedule, I don't foresee posting updates here more than once per week, but aiming for one post a week is a good touchstone to track progress. Speaking of progress, the work I began on the office (months ago) has resulted in a half-emptied, more spacious area to use my new drawing desk, which I adore. I'd be well advised to using NON sketching time to finish the overhaul. We spring-cleaned the hell out of the house last week, except for windows (pointless, right now), and just when we felt ahead of the game, the dog got herself skunked. May be the first real inkling she's had that Not Every Animal is her friend (no, she still has not given up on 'playing' with the cats.) So, we then cleaned her up, and now I am gazing at my floor, which needs a mopping. I think I will do the entrance today, and the rest tomorrow. I am thinking about dinner.....homemade tomato sauce needs to be started in.....hmm, ten minutes ago, if I want it with meatballs tonight! Time to start the sauce, then mop.....says the procrastination monster. I have also procrastinated on final drafting the poem I wrote a few months ago....even I am tired of winter right now, so that may be on hold until July. The business venture I am working toward actually dovetails nicely with the current project, as it's going to be healthy to test out my working routine on something more low-key than a 50+ hour/week effort! Part of the effort has a lot to do with healthy habits, so it's off to guzzle some water, shelf the computer, make some sauce, and tackle the floor.